Modern Masters Volume Seven: John Byrne, published by TwoMorrows Publishing, 128 pages, $14.95. John Byrne has made quite a name for himself since the early seventies, when he began his career as a comic book artist. He has drawn most of the classic characters of Marvel and D.C. Comics, and helped revive major characters for both companies as well. Interestingly, he has also developed two distinct followings: those who love him and those who love to hate him. Regardless, he has racked up an impressive career which has recently been well-covered in Modern Masters Volume Seven. Jon B. Cooke and Eric Nolen-Weathington treat readers to a Q&A session with Byrne that is informative, entertaining and substantial, the interview itself being over 80 pages long. 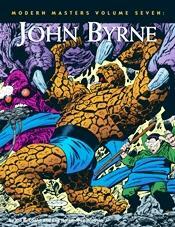 For all intents and purposes, the book covers the entirety of Byrne?s career. However, one of the most interesting things about this book is that it may shed some light on why Byrne is so disliked, almost maniacally, by some fans. In part, this is done with the words of the man himself about his sometimes-brusque personality, as well as the occasionally over-the-top enthusiasm of some of his fans over the years. Personally, the book made me more sympathetic to Byrne, not less. And, for those who may be wondering, I do not, as of this review, have a membership to his site. Though, having enjoyed the book, I suspect I soon may. Of course, plenty of art work accompanies the interview, including finished and unfinished pieces, as well as previously unpublished work. Lump in an introduction by long-time fan-favorite artist and close friend of Byrne, Walt Simonson, and a 33-page sketchbook following the interview and you have a very interesting volume for comics history buffs, and a dream come true for Byrne fans. I know, because I’m both. Modern Masters Volume Seven: John Byrne is highly recommended for those two groups of fans. Find it at comics shops, online retailers and auctions and at www.twomorrows.com .